Golden Apples: Hi Roy G Biv! Cuff is done—and almost finished; most of the cut ends of the stripes woven in-- Roy G and one set of B - I and V still need to be worked in. I like how they look already! 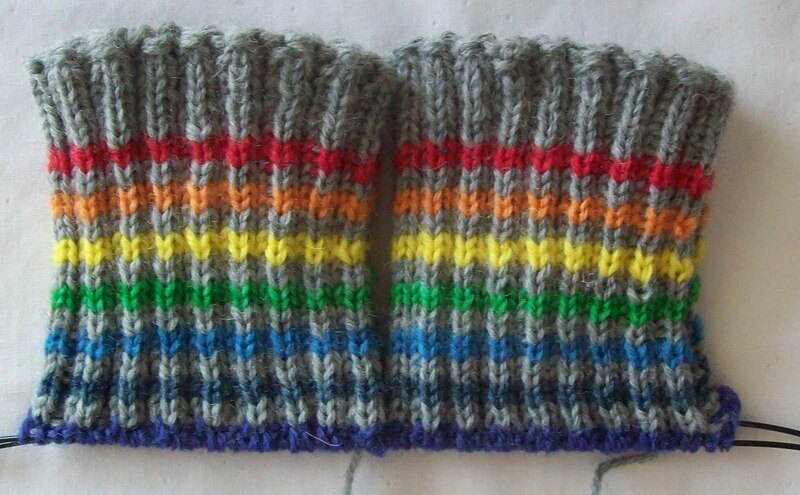 Next: Roy G Biv again—in a different pattern—but the grey separating stripes will be repeated. The Flap? (Just 56 R's away!) will be solid grey as will be the turning. The flap and turning, will be positioned to keep the stripe pattern on the instep intact. Then another repeat of the Roy G Biv pattern—then a solid grey toe. One big advantage of making your own stripes, is the pattern will be perfect over the instep. I always warn other knitters, Sock knitting is pretty addictive. I keep thinking: Enough. But then, I finish one pair, and can't wait to start another. Wool for other projects; wool I have envied and admired (NORO silk and wool--a yarn that I now have in my stash)—cry as it might, sock yarn cries louder “KNIT ME”--and a vest of many colors is still just a thought. Been doing some late season spring cleaning (not just organizing the sock yarn) and found my pair of lost socks (sandwiched between 2 long sleeved winter T shirts). Not a very special pair—but one more for the collection. You can now see all MY socks (no images yet of the pairs I have given away—in my Face Book Photo Album. Those stripes are so cute. And you are right about the addiction--I can't stop with the socks no matter what I tell myself. There are just too many ways to knit a sock and too many great sock yarns. Hope you had fun at S&P! Looking forward to pix. I want to know what Citi Field looks like, too!